When Sarah Wilber (‘14, Communication, ‘16 M.B.A.) was growing up, it was her father who encouraged her to explore the world and seek new challenges. With this advice, Wilber came to Humboldt State. And for the last five years, she’s learned that keeping an open mind to new experiences is key to seizing life’s opportunities. 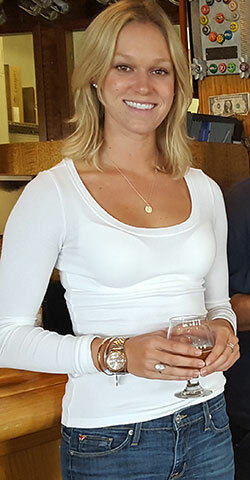 Sarah Wilber (‘14, Communication, ‘16 M.B.A.) at Six Rivers Brewery. The recent graduate’s hard work and ambition have also helped one local beer producer make strides toward becoming a zero-waste business. During her graduate internship, Wilber guided McKinleyville’s Six Rivers Brewery through an extensive audit of its operations to help the business shrink its environmental impact and boost savings. The project got its start when co-owner Meredith Maier-Ripley approached Wilber, who was then working as a server, about working on reducing the business’s waste. Wilber jumped at the opportunity. The former HSU Volleyball player literally immersed herself in trash, going through the restaurant’s garbage. During on her weeklong analytic dumpster diving, she found the brewery was producing 190 pounds of trash and potential compostables every day. Following Wilber’s assessment, the brewery started sending its compostable paper goods and post-consumer food scraps to a local worm farm, and saw dramatic results: trash output dropped 84 percent to only 30 pounds a day. Wilber has also worked with local suppliers to reduce the packaging on goods coming into the restaurant. The business eventually wants to make its entire menu from locally sourced products. “Our goal is to create a closed-loop system in Humboldt County. We want to get all of our products locally to boost the economy as much as possible,” she says. Wilber came to Humboldt State on a volleyball scholarship and she played her freshman and sophomore years before leaving the team to focus on her studies. The Mission Viejo-native was introduced to the field of Communication by Professor Tasha Souza who told her the degree would pair well with any career. The longer she stayed in Humboldt, the more opportunities she realized were there for the taking. “This rural county is able to put forward really innovative ideas, and that’s what made me want to get my MBA here. There’s so much opportunity here that you don’t get anywhere else,” says Wilber. Looking back at her graduate degree, Wilber remembers the rigor of Professor Joshua Zender’s accounting course—who she says prepared her for almost any real-world accounting scenario—and Professor Tyler Stumpf’s illuminating course on organizational theory. Both courses, Wilber says, helped show her that the MBA has given her the knowledge and skills to play a leadership role in whatever path she takes.